ANNE FERRIS WILL return to the Labour parliamentary party in the autumn provided she continues to support the government in Dáil votes. The Wicklow TD lost the Labour whip last month after she voted against the party on Clare Daly’s bill to legislate for abortion in cases of fatal foetal abnormalities. Labour voted against the legislation on the advice of the Attorney General that it was unconstitutional despite widespread support within the party for supporting the measure. The party passed a motion at its conference this weekend committing it to campaign for the repeal of the 8th Amendment at the next general election. A party source said that Ferris can apply to be readmitted to the parliamentary party whenever she likes. If she does so Ferris would likely be readmitted in September or October when the Dáil resumes after the summer recess. 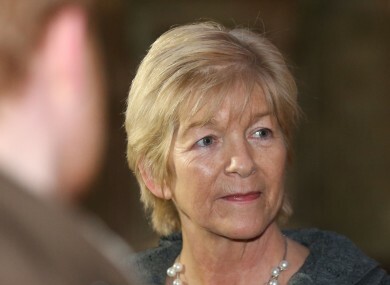 In the interim Ferris has been told she can remain on the Oireachtas Justice Committee, where she is vice chair, and can retain her office on the Labour floor in Leinster House. However this is on the condition that she continues to support the government in forthcoming Dáil votes. Failure to do so could see Ferris taken off the committees and face an uphill battle to be readmitted to the Labour parliamentary party. The source added that they were “fairly confident” Ferris would be Labour’s candidate for the general election in Wicklow. The party currently has no elected representatives in the constituency after the local elections, aside from Ferris who remains an ordinary member of Labour. She did not attend this weekend’s party conference in Killarney. The party’s deputy leader Alan Kelly paid tribute to her on Friday night, describing her as “a great lady” who would have been welcome to the conference. “I spoke to Anne on a couple of occasions and I spoke to her straight after she made her decision in the parliamentary party meeting. I was the first person to speak to her actually. We will speak to Anne again. It was a very difficult situation for Anne and I appreciate that,” he said. Email “Labour will allow this TD back on one condition...”. Feedback on “Labour will allow this TD back on one condition...”.